Proper horse training is a long process, not a quick fix. Since every horse is different, there's no one-size-fits-all when it comes to how long a training session lasts. However, shorter training sessions that keep a horse focused and interested are better than constant, dulling drill sessions. Limit periods of intense training to 20 to 30 minutes or less. That doesn't mean you only ride the horse for that period, but the rest of the session should consist of a sufficient warmup and then a let-down time. Work followed by a trail ride or a hack around the farm is a often a treat for the horse and rider. It's important to always end the training session on a good note, even if your horse wasn't particularly cooperative or did well in an exercise. Finish the session with something he does well, even if it is relatively minor. Remember that horses don't just learn during formal training sessions. Whenever you interact with a horse, you are training it -- for better or worse. An old horseman's saying advises,"If you let your horse get away with something twice, you've trained him to do it." That's why it's important to always pay attention to what your horse is doing and gently reprimand him if he's misbehaving. 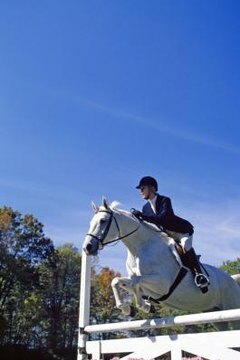 Many "rank" horses are just those who have been allowed to behave badly by novice owners, but it takes considerable effort by an experienced horse person to retrain the animal properly.